Again has Mr. Igor Irikov sent me a scan of an interesting item. This time it is a postcard sent to Riga from Daugavpils. 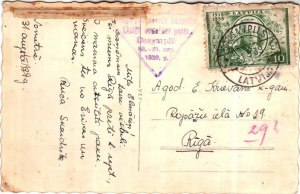 It is cancelled with the standard postmark DAUGAVPILS E, -1 9 39. It seems that some kind of label has been applied at the card. "29 ?" is written in red by the address. Of that we can asume that there is something wrong with it and a label to explain the incorrectness was applied. 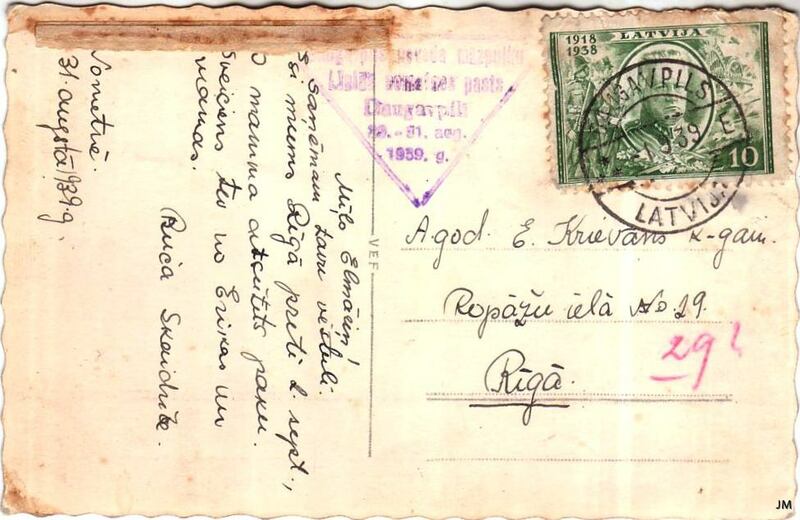 The interesting thing with this postcard is that there is a triangular cachet applied with the text "Daugavpils novada mazpulku lielās nometnes pasts Daugavpilī 29. 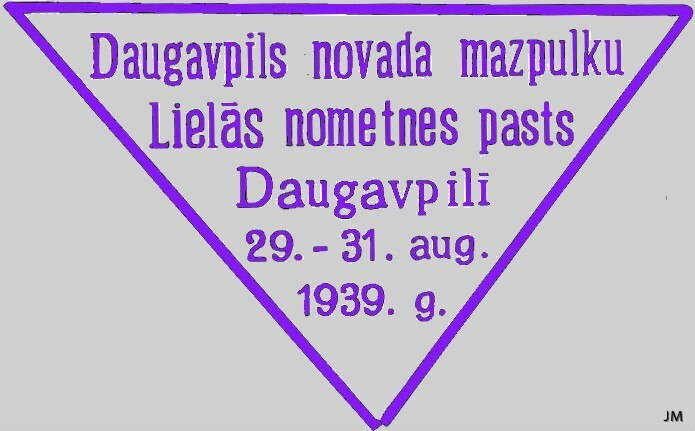 – 31. aug. 1939. g." (Daugavpils area youth club large camp post at Daugavpils 29 – 31 August 1939). The card is dated at the camp on 31 August, 1939. If there are more such cachets from other "Mazpulku" camps, I don't know. Until now I only have seen this. Existing with the word "mazpulku" on philatelic items is also the slogan hand stamp #44 "Pošaties mazpulku 10 gadu svētkiem 4. septembrī Rīgā" (Prepare for the youth club 10th anniversary on 4th Septemper at Riga). This was officially used on mail 30.08. – 04.09.1939. Daugavpils "mazpulku" area was at this time the largest in Latvia with 137 youth clubs. The oldest one was Auleja youth club established in 1931, the first Latgale youth club. At Daugavpils camp the participants had to get up at 07.00 to do gymnastics and washing until 07.30. From 08.00 – 09.00 there was breakfast and after that different agricultural studies. After dinner and some rest then it was time for military and protection demonstrations. In the evenings there were folk-dances, sports, games and folk-song singing. At eight o'clock in the evening there was time for camp-fire but at 21.30 it was time for the bed.